Nobody wants to do it but most of us need to do it badly. The dreaded Driving Test! The practical driving test is designed to test an individuals ability to drive a car safely. They must negotiate a series of challenging road and traffic conditions whilst demonstrating knowledge of the ‘Highway Code’ and ‘Safe Driving Practices’. The UK driving test came into existence in 1935 and has changed and evolved throughout the years, resulting in the modern day driving test. The driving test in its current form takes approximately 40 minutes to complete, and costs £45.50. It can be booked online, over the phone, or by post. You cannot book a practical driving test before you have passed the Theory Test. 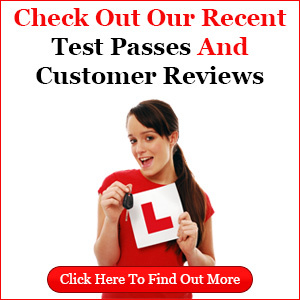 1.6 million people take a driving test each year and the average pass rate is 43%. You must meet the minimum eyesight requirements and must provide a fully insured vehicle. The marking system consists of both minor and serious faults. Minor faults are errors that a candidate makes having no immediate effect on the safety of your car or other road users. You are allowed a maximum of 15 minor faults. However, 3 or more minor faults of the same type can be upgraded to a serious fault if the examiner feels that the recurrence of this fault might develop into something that will effect safety. If the candidate commits a fault that has an immediate or potential effect on the safety of the test vehicle or any other road user, a serious fault will be recorded resulting in a test fail. 1) The Turn In The Road. 2) The Reverse Around A Corner. 3) The Reverse Parallel Park. 4) The Reverse Bay Park. In addition the candidate may also be asked to perform the ‘Emergency Stop’. This is at the examiners discretion. There are 19 of these questions. You will be asked two of them. You will receive one minor fault towards your overall test score whether you answer one or both questions incorrectly. Independent driving was introduced to the driving test in 2010. For 10 minutes of the driving test the candidate will be required to drive unassisted whilst following signs, directions or a simplified diagram. This was designed to make the driving test more realistic, the aim to reduce the number of post-test accidents. The effectiveness of ‘Independent Driving’ is debateable. There are many other changes to driving, post-test that are being considered and only time will tell if these things will be brought to life. The driving test has evolved a lot since its inception and will continue to do so. We believe that a 43% national average pass rate is disappointing and comes down to poor instruction and underprepared candidates. Don’t take any risks with your driving test. Let the Belfast City Driving School show you how to pass your driving test first time.